We want to draw your attention to a NEW TAB we have added to our website. Named the FINE ARTS LINE ONLINE BOOK, this is a study of many of the controversial discussions and viewpoints that have previously made collectors tentative about purchasing Pairpoint items having plated or sterling silver components. This book, when coupled with all of the catalog and database materials found on this website, should make any collector comfortable with pursuing Fine Arts Line products. We hope you enjoy exploring the opinions, facts, and logical arguments presented. Due to the size of the page, please expect a few-second delay for loading. As those of you familiar with Pairpoint’s Fine Arts Line already know, you don’t need reference books to identify these desirable beauties. Not only did Pairpoint sign each item (“Diamond P” or spelled-out), they also included their catalog number. For those not familiar with the Fine Arts Line, we encourage you to read our online book which can be accessed by clicking on the Tab on this website. Basically this is the product line that combines Pairpoint’s finest glassware with beautiful silver-plated sculptured metal mountings. Also within our Download Center are almost 350 original Pairpoint Fine Arts Line catalog pages as well as considerable database information. Anyone thinking of purchasing ANY item from the Fine Arts Line should avail themselves of the research information on this site. By cross-referencing the catalog number found on the item with the appropriate catalog page, the collector can see exactly what the item is supposed to look like. Our experience with Fine Arts Line items has shown a frighteningly high incidence of marriages or missing elements. Caveat Emptor! Now, with all of this warning, there is a positive side to validation…Great Buys are out there for those who have done nothing more than validate the item. We’d like to cite a very recent example of an item that looked incorrect but was actually OK; it’s very unusual to have right and wrong on the same item, but validation resolved the issue. Needless to say we made a very good buy. 1.) This first photo shows a pair of Pairpoint D6157 Art Deco candlesticks combining a bubble ball, a silver-plated candle cup, and green marblette mounts. This was the eBay image as offered, and could be considered correct to an untrained eye. 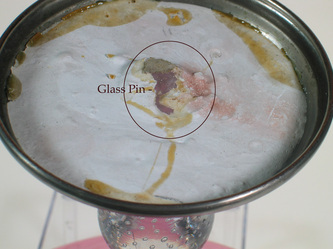 However, the flat-ground surface at the top of the glass ball raised a validation concern. ​2.) This second photo is a cropped portion of Catalog Page 165, from our Download Center. This shows that the above eBay items offered for sale are missing their marblette bobeches. What a shame! But wait…look closely at the catalog image (below) and the item being sold (above); notice the circular disc sitting directly on top of the square base on the eBay item, and notice its absence in the catalog image. You have found the missing bobeches which could have been (unluckily) missing entirely. This candle was shown in the catalog as being part of a Console Set made up of a pair of candlesticks and a matching centerpiece bowl. The bowl portion had a shallow configuration and was EPNS (electro-plated nickel silver). In closing, Sandy and I cannot stress enough the importance of a little due-diligence before you risk your money to make that great buy when building your Fine Arts Line collection. We are very pleased to announce that the Pairpoint Glass Knowledge Center Research Section has been opened to all visitors. Simply go to the FREE SITE ADMISSION Tab and choose your option. PLEASE VISIT, ENJOY & COME BACK OFTEN! Most of our Pairpoint friends are already aware that the era of the original Pairpoint manufacturing activities ended in 1938, and after many months of uncertainty, was revived as the Gundersen Glass Works in 1939. Fortunately for them, and us, they were not out of the marketplace long enough to lose their client-base; many of the premier jewelry stores, distributors, and retailers returned to do business. When Gundersen emerged from the Pairpoint Corporation collapse, they were much smaller in size, but they were able to re-employee many of the skilled workers, especially the highly-skilled ones, such as Anders Thoen and Gilly Gulbransen. As the manufacturing volume returned, the products retained the expected Pairpoint quality, which didn’t go into serious decline until the end of the Gundersen-era in the early 1950s. This single fact was likely the reason for the retention of the elite clientele. According to various sources, most notably “Mt. Washington & Pairpoint Glass, Volume Two,” by Kenneth Wilson and Jane Shadel Spillman , one of the quality distributors returning was Carbone, Inc., purveyors of quality general line goods. Not wanting to share the sources of their merchandise, their advertising references were limited to saying that their “Bedford Glass” line of decorative glass was made in the same factory as Pairpoint Glass. In one of their 1940 Christmas catalogs, they were promoting a new glass product line named Claire-de-lune, a blue-green hue made of Lime Glass. From our observations, many of the shapes offered by Carbone for the 1940 Christmas season were traditional Pairpoint shapes, but did include some more-contemporary-to-the-time items. To many Pairpoint collectors, the existence of the Carbone Claire-de-lune blue-green product line creates an anomaly. While looking in every way identical to Pairpoint items from decades previously, the color becomes a head-scratcher. Not only does the color confuse, but so does the dull “thunk” when tapped (because of the lime formula, not lead), and the fire-polished rough pontil mark. These items will appear infrequently, often at very low prices. They are worth acquiring, because they are, for all intents and purposes, true to Pairpoint’s craftsmanship; they’re just made under the Bedford Glass name by the old Pairpoint workers. Wonderful glass items were made during the 13-year Gundersen era. With a smaller staff, it’s my speculation that much of the superb quality of workmanship is due to the likelihood that a higher percentage of the items made came from the hands of the “stars” of the Pairpoint era, as the less-qualified workers and apprentices moved to other industries and the war effort. I know that engraver Carl Silva left to work for Morse Twist Drill. Hopefully this article sheds some new light on what has always been an unresolved curiosity for many Pairpoint collectors. Once in a Blue Moon, or should I say "Lilac Moon," an example of Pairpoint glass appears that is lilac in color. 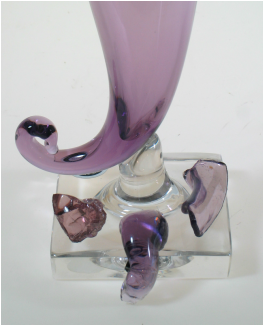 Our first experience was with a lilac Cornucopia Vase with a square foot in clear. The style of the vase was true to the many other examples of the Cornucopia vases normally attributed to the Gundersen-era, but known to be made before 1938, as well. At the recent Hoosier Glass Show, in Indianapolis, a dealer friend, Jim Watson, had for sale a beautiful A298 Urn Vase in this identical lilac color, a very confusing (or enlightening) occurrence. The A298 Urn Vase is not a commonly-seen item, and would typically not be attributed to any time period after the traditional Pairpoint-era that ended in 1938. Needless to say, there was a lot of commiserating and head-scratching among knowledgeable dealers and collectors about the Lilac Pairpoint vase in Jim Watson's booth, which certainly raised a legitimate question about the production of a lilac color by Pairpoint, the timing of the production, and whether it could be nothing more than a pale shade of the deep rich Amethyst color. Remembering our stockpile of Pairpoint glass shards dug from the Pairpoint factory site in New Bedford in the early 1960s, before the big fire, Sandy and I dug through our stash this past weekend. Out of the 200-300 pounds of shards, we found only three pieces of Lilac, which we have photographed for this article. Since it was dug in the 60s, we can only speculate whether it came from the Pairpoint-era or the Gundersen-era, but we can say with a high degree of confidence that Pairpoint did make a Lilac color. Two remaining questions would be (1) is this Lilac color just a lighter shade of Amethyst, and (2) was it intentionally formulated? A close examination of the Lilac next to a similar thickness of conventional Amethyst does show a similar hue, leaning toward red versus blue on the color wheel. Secondly, the existence of more than one finished example from seemingly different time periods, and the presence (albeit sparse) of glass shards from the dig, would indicate the use of the Lilac color was intentional. If the Lilac only showed-up as Cornucopia vases or only as A298 vases (typically expected to come from a few decades apart), we could speculate about the color being experimental, or special order, or short-lived. But as the examples have appeared, Lilac seems to have been made over a longer span of time, perhaps sporadically. If this would be true, why have other examples not turned-up more regularly, or perhaps they have and we haven't seen them. If any of our readers have any information or other sightings of Lilac, please contact me at marionfrost@mwpgs.net.com or marionfrost@verizon.net. Photographs would be fantastic. A New Subscriber Tab - "Archival Goodies"
After spending many years with the tens of thousands of pages of archival material that made this website possible, we have started the process again. This time, however, our focus is on the matters of interest that never became part of the database project. The "Archival Goodies" section will be the repository for all things of interest that we discover now and in the future. As you might agree, we hope this section is never completed. Our first topic (sub-tab) is called "Changing the Pot." This is a photographic sequence showing the process of changing out a damaged or worn-out clay pot in which the glass-making ingredients are melted to make your favorite vase or bowl. Also featured are copies of the original blueprints, from 1904, showing the entire furnace and clay pot designs. These are works of art by themselves. They will also appear in the Download Center so they can be viewed in a much larger format for those engineers among us. Make it a point to periodically go into the "Archival Goodies" section to see what has been added. Several years ago we acquired some very important documents relating to the beautiful lamps made by Pairpoint during the 1920s and 1930s. There were hundreds of pages of price lists and internal technical memos, but most unique was the original Pairpoint Price Book used during the 1920s. 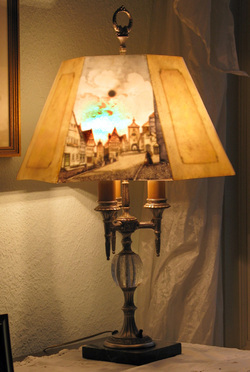 On their face, they would be considered invaluable to the documentation of the Pairpoint Lamp product line. However, in practical terms, the documents aren't much use at all to anyone but an extremely advanced collector or restorer of Pairpoint Lamps. In an effort to place everything possible into the public arena, we decided to create a database of all the information in our possession. This database is a compilation of almost 1,200 line items containing lamp shades of all types, lamp bases, light bulbs, parts, types of finishes, and more. Product numbers and decorating pattern names appear as well. By itself, this database will be of little use, because there is no photographic cross-reference. However, if used in conjunction with the already-existing books on Pairpoint Lamps, such as Schiffer's, Malakoff's, and Wilson's (Volume 2), we think some order can be brought to better understanding the subject. This Pairpoint Lamp Database can now be found in the Download Section, which is available to our Subscribers. 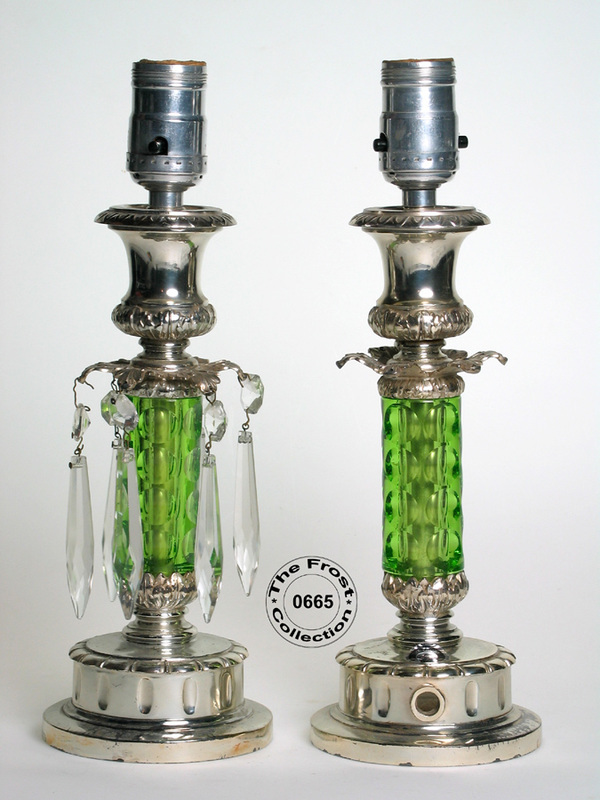 What About Pairpoint Glass with Silver Bases? 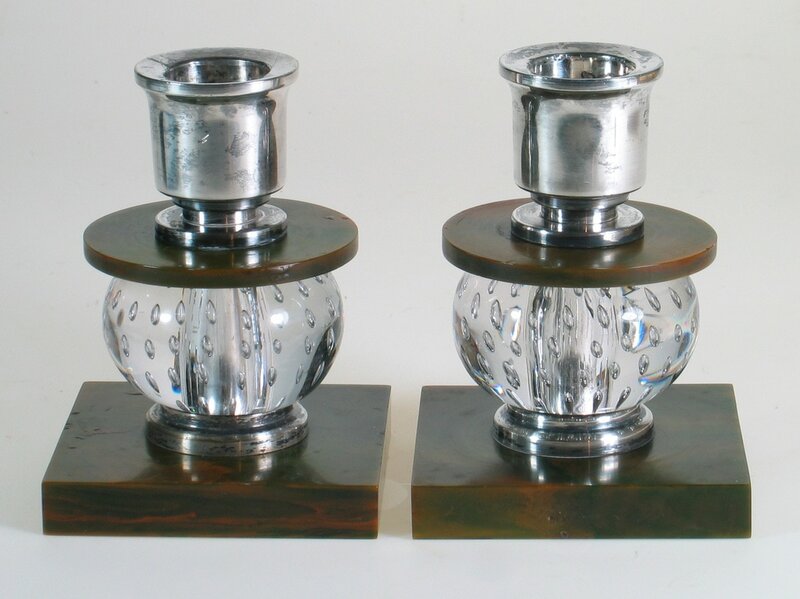 Everyone knows (just ask around) that if you find a Pairpoint Glass item that has a sterling or plated silver foot, you are looking at a marriage. A marriage occurs when someone has a broken item and figures out a way to attach the good portion of one item to the good part of another item. Most commonly you will find a glass compote top stuck into an old candlestick, or a bowl attached to some type of metal pedestal base. Unless the item is a known and marked Fine Arts Line item, most dealers and advanced collectors will walk away from what they "know" (that's code for "believe") is an illegitimate marriage. That’s why Sandy and I have made so many great inexpensive purchases over the last few years. 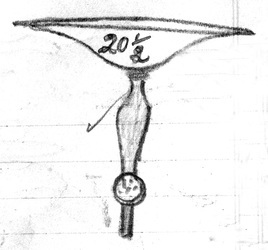 Until we obtained a one-of-a-kind Pairpoint Engraving Department Supervisor’s personal notebook, that has scores of line drawings of Pairpoint Glass items, we would walk away also…and did. Until this moment, it has never been public knowledge that Pairpoint blew a number of their standard items with integral long glass mounting pins, intended to be mated with sterling or plated silver bases. 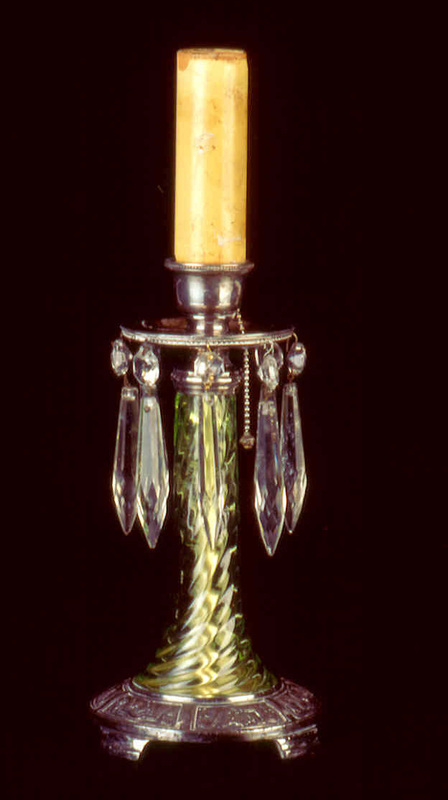 These glass items were generally sold to fine jewelers and silversmiths to apply their own unique custom bases. We speculate that it is likely Pairpoint mounted some for their own account, as we have found numerous bases having the identical design, some being of plated-silver instead of the more common sterling silver. Pairpoint worked in plated silver wares regularly. This entire topic is discussed in much greater detail in our Fine Arts Line book which is available in the Download Center of our Subscriber section. There is also a reprint of the Engraving Department Cost Book available in our on-line store. 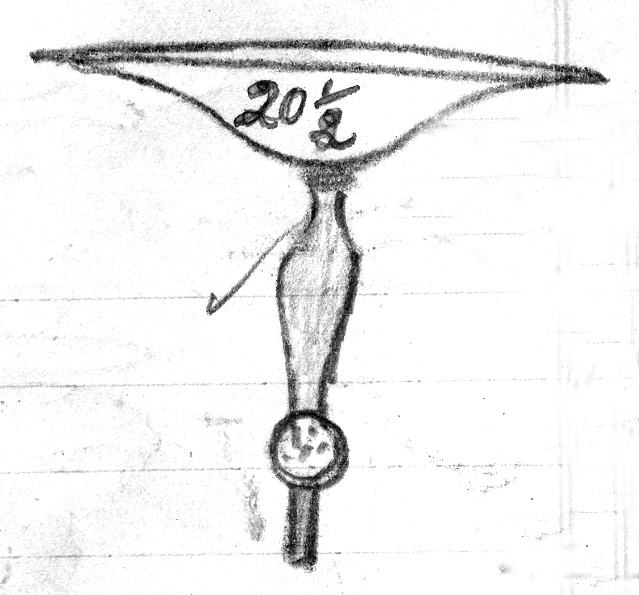 However, as a treat to everyone, we are sharing a number of the aforementioned sketches, as well as two real-life images of a Rosaria Comport showing the tip of the glass pin from under the foot. We have separated numerous so-called “marriages,” and found everyone with glass mounting pins. We consider the subject closed, and only hope that we are next in line as the knowing skeptic walks away from another Pairpoint treasure. You may have noticed that we have been doing some fine-tuning throughout the website since the launch. Well, we just made a major improvement to the way we present the Catalog Page images to you. After testing and living with the website for a few weeks, we noticed that when we went to enlarge the Catalog Page images from within the Subscriber sections, our images started to pixilate (get fuzzy) too soon, and it was almost impossible to read the small print. Upon investigation we discovered that the website software automatically restricted the level of resolution we needed to be satisfied, even though we uploaded the files at the proper resolution. We solved the problem by including all the Catalog Page images, in a higher-resolution JPEG format, within file folders that can be directly downloaded to your computer from the PGKC Download Center. This gives you immediate access to more than 1,100 Pairpoint Catalog Pages that you can view in great detail and manipulate using your computer's image software. Can you imagine, as a Pairpoint Glass collector, owning and having at your fingertips 1,100+ original factory catalog pages? Even if you could find that many, you would pay a price far, far greater than our nominal Subscriber Fee. So please visit the Download Center, located under the Subscriber tab, and download the three new Catalog Page folders to your computer. This website is dedicated to our friends Charles and Barbara Coulter, long-time Pairpoint collectors and dealers, and the reason this Pairpoint research project ever came into being. No one, including themselves, could ever know the importance of the role they played in preserving the Pairpoint legacy for all time. Others participated along the way, and played important roles, but the seed was planted when Charlie handed us that first Pairpoint invoice that he had found in the factory ruins before the big fire. Pairpoint enthusiasts everywhere owe Charlie and Barbara a debt of gratitude; we know we do! Our love to you both. Thank you for visiting our News Page. This page will be constantly changing and will feature all types of information and matters of interest. Please visit us often as we showcase Pairpoint products, people of interest, dealers, glass museums, and topics that would normally never see the light of day. And, let us know if there is a topic that you would like explained or discussed in future postings.